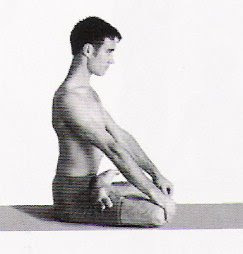 1. padmasana It's the most recognizable yoga posture, and if you can do this one, it's easy to forget how difficult it c an be. The average Western student brings hips and knees with decades of culturally-dependent conditioning that involves very little external (lateral) rotation. In plain English, most folks knees don't do this. Of course, the hips are the real issue, but it's the knees that suffer, and it takes a long damn time for some people. Perhaps more than any other pose we'll list here, this one opens up a whole family of related postures and variations on other postures. 2. urdhva dhanurasana (dropback) Let's face it - we could all dropback if we really wanted to. What's stopping you (other than common sense and self-preservation)? To learn to dropback and come up is almost higher-order level integration of the body - above and beyond (and built upon!) the run-of-the-mill standing and seated postures. This is due to the coordination of the full length of the body and because of the use of momentum - something which is rare in yoga. Of course, we gradually try to eliminate momentum here as well, but at first it's unavoidable. And of course, we haven't even mentioned the fear factor: we witnessed students bawling in the middle of the shala in Mysore, having finally dropped back for the first time. 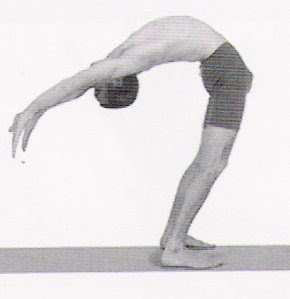 3. hanumanasana Another quinessential, classic posture, not just in yoga but in all physical arts. She is beautiful, but she is a Siren, her beak and claws bloody with the hamstrings of the over-eager. And yet, you keep going back and trying...there's just something about that beautiful symmetry... 4. adho mukha vrksasana Enough said. Well maybe not quite...I mean seriously, what's cooler than standing on your hands? This one also opens up new vistas of poses, variations, and, especially, vinyasa combinations. It's different than all the other postures h ere because balance is an enigma, and entirely different animal than strength and flexibility, which seem to follow a more-or-less linear development. There really isn't anything anybody can tell you about handstand. You almost have to pretend you're the first person who ever tried to do this and figure it out for yourself, especially once you're trying to move from using the wall (which, let's face it, is mostly lame) to free-standing. In the living room. At the studio. At the office. In the grocery store. Doctor's office. Countless. G**d**n. Times. Until you finally get it...and can hold your newfound skill over everyone's head, literally (talk about a motivator!) As a final note on adho mukha vrksasana, notice that it is eventually combined with the urdhva dhanurasana dropback, sort of like when the Power Rangers link up to create one enormous hero. In this case, the final product is viparita chakrasana, the hands-over-feet-over-hands, back-and-forth movement that could be considered the pinnacle (or maybe a pinnacle) of yogasana as a purely physical practice. Strangely absent are eka/dwi pada sirsasana, the leg-behind-the-head postures. These are perhaps second only to padmasana as far as recognizability within yoga and also as a prerequisite for a number of other postures. As far as our survey, handstand was the most common answer. Other than that, there was a surprising diversity: backbends, arm balances, hip movements. You can certainly tell the Ashtanga influence, as some people are thinking in terms of movements and posture combinations. At the risk of turning this into a Daily OM...it is pretty certain that whichever postures are most evasive for you, they are the ones that teach the most. Ok, enough chit-chat. Let's get back to work on that adho mukha vrksasana, eh?